Let’s say, for the sake of our argument, you are the sole owner of the only working time machine in existence. Rather than using it for good or evil — like rigging the election so Donald Trump was never elected, killing Hitler, or pulling a Bif and using your sports knowledge to create an empire — you slip through the space-time continuum to ask iPhone users if they care much about the home button. If you set your machine to take you to 2015 or earlier — to a time before the iPhone 7 came on the scene — the answer would be an indifferent shrug. It’s a button to unlock and navigate your phone, but ultimately its function is superseded by more interesting software. If you didn’t care about affecting the future and told everyone about the present’s general attitude surrounding the fabled iPhone 8’s home buttonyour past friends would be surprised. Things are a lot different in 2017 and not just because the executive producer of Celebrity Apprentice is now Commander-in-Chief. Thanks to the iPhone 7 line — which was released in September 2016 without a physical button to depress — the home button is a huge topic of interest to gadget groupies. The 7’s haptic home button wasn’t the only major hardware change-up that rocked the world. It also came with the distinct lack of a headphone jack, instead relying on iCloud enabled AirPods to listen to any audio. This isn’t the first time Apple has forced change upon its fans, nor will it be the last. 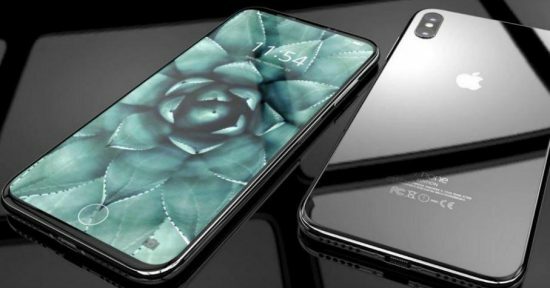 No stranger to controversial facelifts, Apple is once again embroiled in another home button based drama thanks to the latest iPhone 8 mock ups. Months ago, rumors suggested Apple was investigating an OLED display capable of reading your fingerprint through its touchscreen. The button as a physical object would disappear completely and would rely on Apple’s Authentech algorithm in order to read your thumbprint. 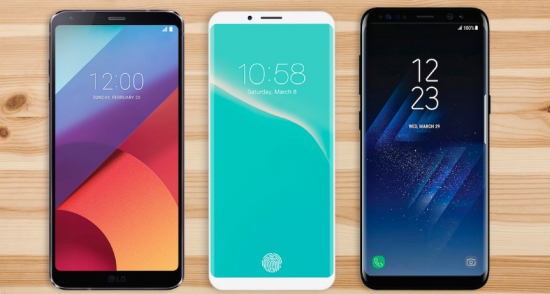 This placement would eliminate the need for a bottom bezel, allowing for the Cupertino-based company to produce a larger, edge-to-edge display similar to Sony’s Galaxy S8 line. Unfortunately, additional rumors later hinted the technology can’t support this innovative unlocking technique. Yet, with the latest mock-ups showing the full display without a home button, speculation about Touch ID’s discontinuation is running rampant. Experts think Apple plans to use 3D sensors to read facial features in order to authenticate purchases and unlock the phone. If it’s true, it could enrich Apple’s augmented reality platform, ARKit. It could also hit the same snags that tripped up the S8’s biometric unlocking features. Others think Apple will integrate Touch ID on the back of the phone. Many Android phones, including Google’s Pixel, use this position to great success. For some Androids, like the latest S8 and S8 Plus, this placement interferes with the camera lens, resulting in smudgy pictures. Wherever the home button ends up, owners of the 8 won’t be able to transfer their old iPhone 6 skins to the newest generation. Though stylish and protective, your collection of iPhone skins was tailor-made for that particular generation and nothing more. Luckily, the best skin designers, like the folks at dbrand, will apply the same made-to-measure mentality to every new iPhone 8 skin design they make, ensuring the perfect fit—home button or no home button. Of course, this gives you the opportunity to revamp your decals for a totally new look, or you can stick with what you love and re-order that marble wrap or carbon fiber iPhone skin. The chances are high that you won’t need to reinvest in new AirPods, as Apple claims they will work with any device using iOS 10.That will come as a relief to those worried by the projected cost of the 8, as the handset commemorating the iPhone’s 10th anniversary may be over $1,000. Now that’s something you may not want to share with your pals when you travel back through time. It, along with the outcome of the election, is too much for a pre-2015 brain to handle. Let them live in ignorance as they enjoy their home buttons.